There are a couple sure signs Spring has arrived. Of course the weather warms, the wisteria blooms and the markets are full of beautiful asparagus. While I will eat simple roasted asparagus every day, it is nice to do something special with it. And what is more special than soup? 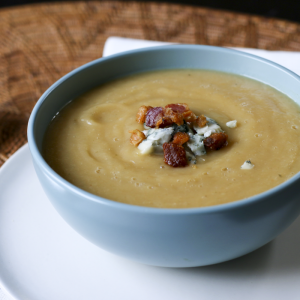 Leeks and potatoes mellow this soup, and lemon, dill and a medallion of goat cheese dress it up. 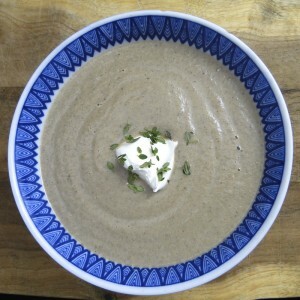 See post on how to prepare leeks as well as post on method for making cream-less pureed vegetable soups. There are various emersion blenders on the market. I have had my Bamix for years, but there are other good, significantly less expensive options including: Cuisinart. The newer emersion blenders are cordless, which is a real advantage when maneuvering them over a hot stove top. Smooth and creamy,but cream-less, this asparagus, leek and potato soup topped with a goat cheese medallion will help you celebrate the arrival of Spring. Make goat cheese medallions by cutting the goat cheese log into 8 slices. They will crumble. Place each slice along with any crumbs between a folded sheet of plastic wrap. Shape each cheese slice into a medallion shape, and set aside until ready to serve. In a large soup pot, sauté leeks and garlic in olive oil until they are limp. Add asparagus pieces, including 1/2 of the tips, to soup pot and cook a couple more minutes until asparagus are bright green. Reserve remaining half of asparagus tips for garnish. Add potatoes and about 8 cups of stock to the soup pot so that all of the vegetables are well covered. Bring to a boil, reduce heat and cook for about 15 minutes, or until the potatoes are tender. Remove from heat and blend using either an emersion blender, a food processor or a blender. 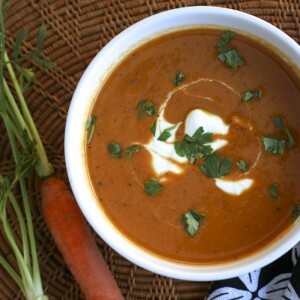 See post on cream-less pureed soups for more detailed instructions. 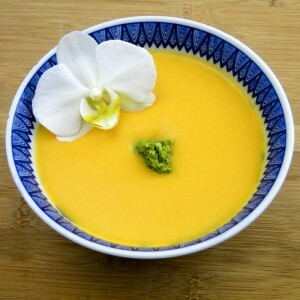 Adjust pureed soup to desired consistency by adding more stock. Bring back to a brief boil and turn off heat. Add yogurt and lemon juice. Season to taste with dill, salt, pepper and red chili flakes. In a small frying pan, melt butter and briefly sauté remaining asparagus tips until they are bright green and al dente, cooked, but still firm. 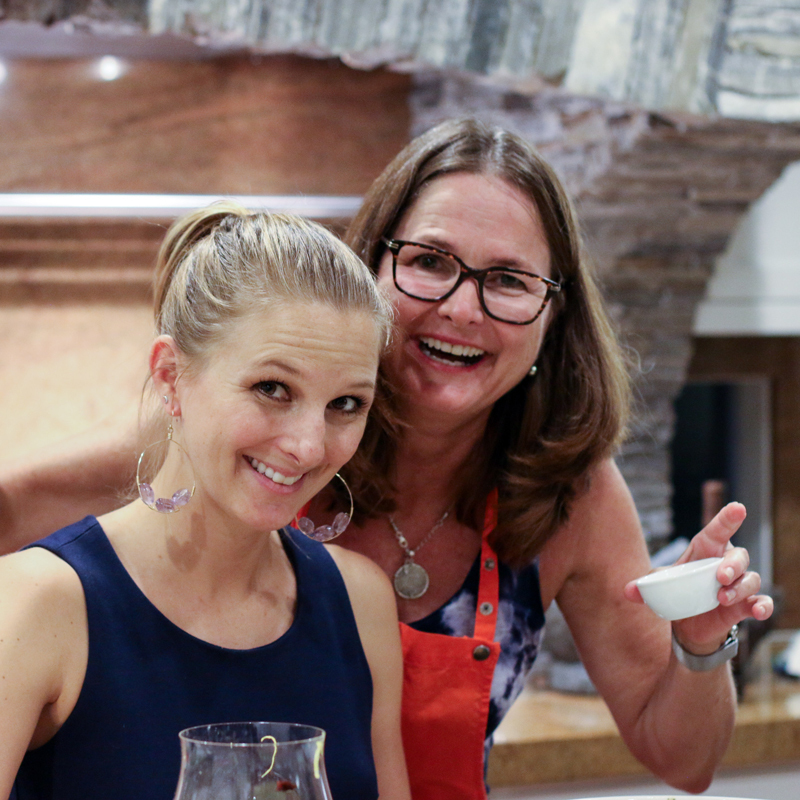 Pour soup into bowls, top with a medallion of goat cheese, a few asparagus tips and a sprinkling of chives. Hi Terry. Saute the garlic with the leeks. I like to get the leeks started for a minute or two and then add the garlic so the garlic doesn’t burn.